I need help reading/understanding my learned values. I am using an OBDlink LX with BTSSM. I have no clue what I am looking at and I have a hunch that my car is not feeling too good lol. 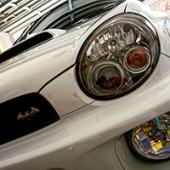 What fuel are you using and what mods? The top line tells you the most in this case. IAM should be 1. Anything less means there’s been enough decent knocking to justify a global ignition retardation. Jap imports will sometimes sit at around 0.9 or slightly less if driven hard purely because NZ 98 is still worse than the jap 100 they’re originally tuned for. In general, a positive at higher g/s ranges means more fuel is being added as there is more air in the engine than has been calculated for. So there is more than likely a leak before the turbo, but after the airflow meter. The turbo inlets like to split so that would be a good place to start looking at a guess. 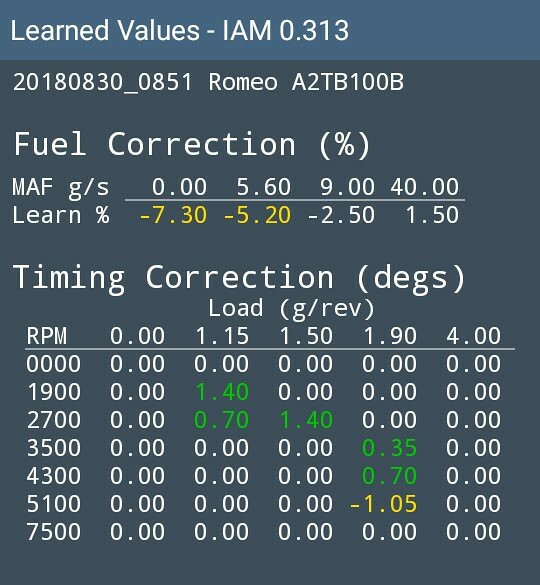 The timing correction section (does the same as IAM but tweaks things in certain rpms/loads rather than over everything) isn't too bad currently. Imagine as soon as the IAM number raises more will show up in that area. All in all you should definitely be getting it looked at. Thank you! That makes total sense actually. I've had a subtech downpipe installed and I use 98 from mobil. The intake piping before the turbo seems warped and I noticed some oil there too. I'll completely remove it this weekend and observe it better. So after a wee bit of driving last night and my drive to work this morning.. below are my updated learned values.. Bizarre or ?? Have you reset the ECU? It takes a shitload of time for the ECU to slowly raise the IAM by itself and it would do it incrementally not just straight back up to one. I had my car serviced on Monday. Didn't ask if they touched the ECU but they may have. So with the latest LV I posted, would it be fair to say that my car is relatively happy? Or should I still see someone? Does it still feel like it's not driving well? Yeah I am. I have this very intermittent stumbling issue that I cannot pin point hence me going with BTSSM. I'm getting crazy lean fluctuations on my afr too. Would a weak fuel pump be the culprit? Or perhaps my warped turbo inlet? How many km’s on the car? I'm 80% confident it is the turbo inlet (but I've been wrong about my car plenty of times lol) because of the oil residue seeping. Oil blow by escaping? Oil being in the inlet is a given unless you have a catchcan. Should be residue, not really a pourable amount. 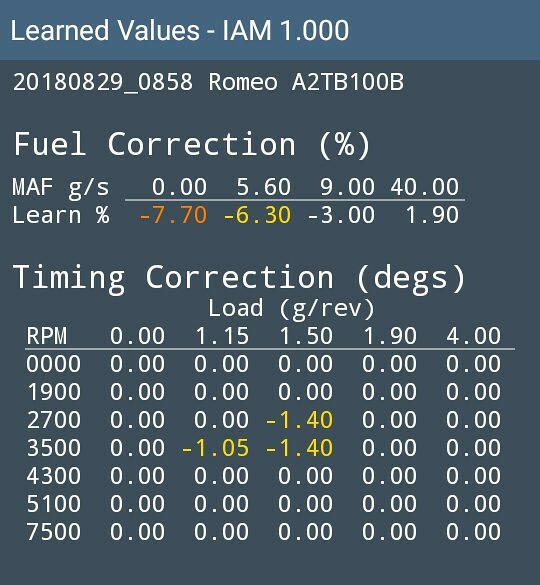 Sounds about the right KM’s for it to be a possible failure point. Yeah no catch can and the oil should stay in the inlet and not outside? Okay, so my IAM numbers dropped again after a drive last night and has remained the same this morning. I'm new to this logging stuff but I'm going to have a go at it today. Below are the new values. Is it fair to say that the high-ish figures in yellow indicate I am running lean? If it's removing fuel (which to me a negative % correction looks like it is), that means it's reading rich. An inlet leak after the maf would create a rich environment. Excuse my ignorance, all of this is new to me. May I ask how it would read rich if there is a leak after the maf? That would mean more unmetered air going in which should read lean? Sorry, i'm thinking in a pressurized pipe (post turbo).